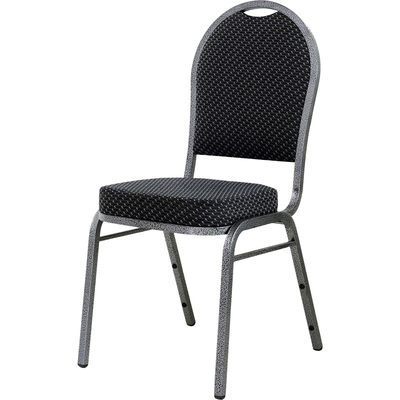 Stacking Chairs Offer A Convenient Solution To Your Need For Sturdy General Seating. The Tubular Steel Frame With No Arms Features A Hammered Oxidized Steel Finish For Durability. The 16-7/10" High Seat And Rounded Back Are Upholstered With Textured Fabric And Cushioned For Comfort. The Seat Cushion Is 2-1/2" Thick, And The Back Cushion Is 1-1/2" Thick. Seat Depth Is 15-9/10". Four-Leg Base Has Nylon Glides. Chairs Stack Up To 14 High..
Stacking Chairs Offer A Convenient Solution To Your Need For Sturdy General Seating. The Tubular Steel Frame With No Arms Features A Hammered Oxidized Steel Finish For Durability. The 16-7/10" High Seat And Rounded Back Are Upholstered With Textured Fabric And Cushioned For Comfort. The Seat Cushion Is 2-1/2" Thick, And The Back Cushion Is 1-1/2" Thick. Seat Depth Is 15-9/10". Four-Leg Base Has Nylon Glides. Chairs Stack Up To 14 High.